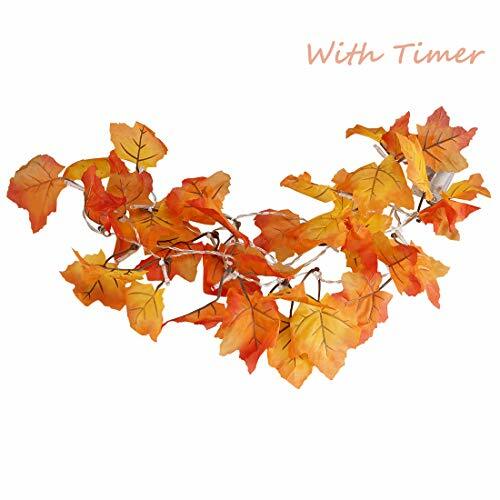 Fall Garland Maple Autumn Harvest LED Lights String with timer by SILIVN. Description:This colorful lighted garland is perfect for doorframes, windows and railings and features 35 yellow lights.This lighted Fall Garland Operated by 2 AA batteries(not included). Package: 1 PCS Comes in a Beautiful Gift Box. Add a modern touch to your house with SILIVN now!! DURABLE - This garland features a suitable length[8.2 feet/2.5m(1PCS)] for Christmas decorations. Bend and adjust to any shape that you like for your decorating needs. WITH 6 HOURS ON/ 18 HOURS OFF TIMER. Timer Function:When set to timer mode, it will turn off automatically after 6 hours, and then light up again at the exact same time the next day, greatly increasing the battery life to up to 3 weeks, reducing the frequency of changing batteries. To read more about timer function, please refer to product description.